Nothing spells relaxation and freedom quite like enjoying a beautiful evening outdoors. Sure, falling into your recliner in the living room is a welcome retreat at the end of a long day. Curling up on the couch by the fire and reading a book is a pretty cozy way to spend a long evening at home. But, what if you could enjoy the same activity with a better view? Curled up next to the fireplace on your comfy furniture, with the stars overhead?! 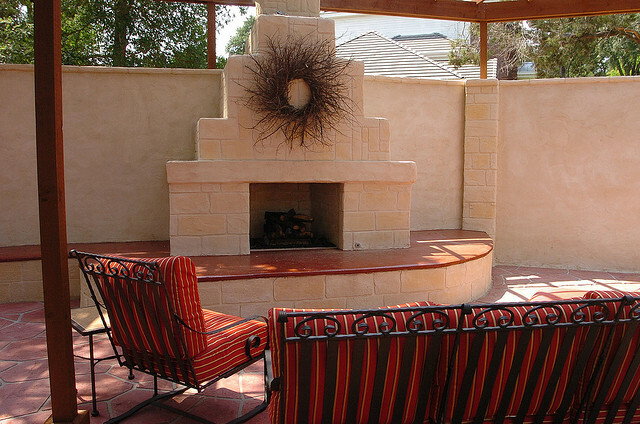 Adding an outdoor fireplace to your patio will bring increasingly more value to your home and enjoyment to your guests. They will look forward to sitting back and enjoying good food and even better company as they listen to the fire pop. Whether it’s a summer evening that requires only the ambiance that a fireplace brings or a winter’s evening where the warmth of the fire itself is necessary, this added bonus completely transforms your mood and that of your friends and family. Conversation tends to linger into the wee hours of the morning because the atmosphere is so relaxing and inviting. At Varsity Pools & Patios, we know that our customers are looking to take their outdoor patio to the next level by adding a fireplace, and we are happy to jump on board! A simplistic and lifeless arrangement of patio furniture becomes an entirely new outdoor space when you add a new focal point. Even the same chairs and tables take on a new look when they are centered around an elaborate outdoor fireplace. Whether you go for something ornate or something more rustic, our talented team of designers will deliver your vision marked with our craftsmanship. We will visit your property and take you through each step of our design and installment process. Our goal for every home and project that we take on is to create an outdoor environment that pulls everyone out back to enjoy it. You’ll sit down in the dining room for your meal but then decide it would be better enjoyed outside by the fireplace. The space is just so cozy and charming that it draws you in, again and again. You will bring year round fellowship to your home with an outdoor fireplace and adjoining seating area. Your customized outdoor fireplace will be built in your own backyard with your own vision in mind. Our company seeks to join with you on this journey and make it come alive with your dream in mind, rather than taking over and making you a silent observer. This is the space where you will be making memories for countless years to come, and it needs to be uniquely your own. Whether it’s a stone fireplace you’re considering or more of a brick fireplace you’ve got in mind, we will help to create the perfect masterpiece. Call us today for a free in-home estimate on a fireplace that will be built in your existing or brand new outdoor living room. We can build fireplaces directly onto a patio or add a fire pit to any outdoor area that you choose. The choice is yours!